Kaiserschmarrn is actually an Austrian dish but you find it on many German menus, too. Legend has it that the wife of Austrian Emperor Francis Joseph I was so obsessed with her slim waistline that she refused to touch this dessert. The Kaiser didn’t want to waste it, so he sampled ‘what “Schmarrn” the chef had cooked up’. He liked it so much that the dessert became known as Kaiserschmarrn across the entire Empire. I like to make Kaiserschmarrn with an American twist, adding blueberries to the batter and serving it with crispy bacon and maple syrup. Preheat the oven to 100°C fan. Separate the eggs and whisk the egg whites with a pinch of salt until stiff. In a separate bowl, add the vanilla sugar and sugar to the egg yolks and whisk. Then add the flour and milk and whisk again. Gently fold in the stiff egg whites with a wooden spoon or spatula until you have a smooth batter. Heat a tablespoon of butter in a frying pan. Add a quarter of the batter, sprinkle with a quarter of the blueberries and cook for a couple of minutes on a medium heat until the surface starts to bubble and the base is nicely golden. Quarter the Kaiserschmarrn, and turn each quarter over so that it can cook on the other side. Immediately start tearing the Kaiserschmarrn into pieces using two spatulas. Cook for another minute, then add another tablespoon of butter while stirring the Kaiserschmarrn. Once the butter has melted, dust the Kaiserschmarrn with a tablespoon of icing sugar. Continue frying for another minute, then put into an ovenproof dish and keep in a warm oven until serving. Just before serving, fry the pancetta rashers in a frying pan until nicely golden. 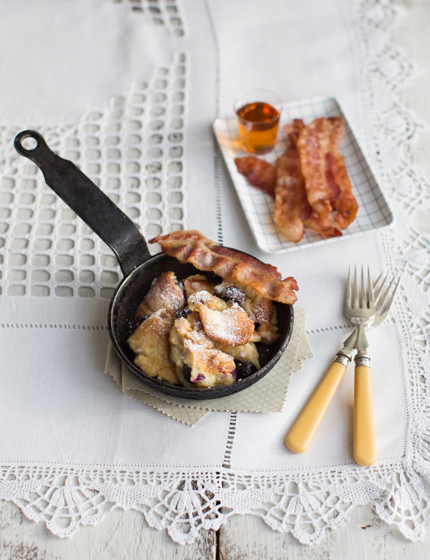 Serve each portion of Kaiserschmarrn with three pancetta rashers and drizzle with maple syrup.